‘Twas a warm spring evening. The air smelled of charcoal and was dotted with bits of pollen. Matt and Mazen were chasing Pumpkin the Cat around our yard, and I was putting the last few pieces of pineapple on shrimp kebobs. After a few minutes on the grill, it was time to eat. 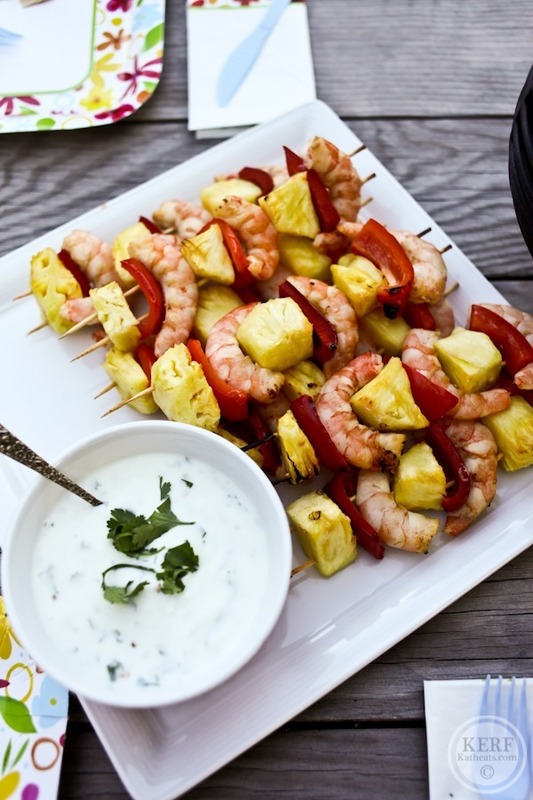 Pineapple Shrimp Kebabs for all! These kebobs are marinated in orange juice and soy sauce with a kick of red pepper flakes and are finished with juicy pineapple and red peppers. Grilled pineapple is one of my favorite foods! I prepared a honey-lime-cilantro yogurt dip to go with them. Drizzle it on top of your kebob or dunk away! These tropical kebobs are marinated in orange juice and soy sauce with a kick of red pepper flakes and are finished with juicy pineapple and red peppers. Combine OJ, soy sauce, red pepper flakes, lime and honey in a bowl and mix. Add peeled shrimp and marinate at least 30 minutes. 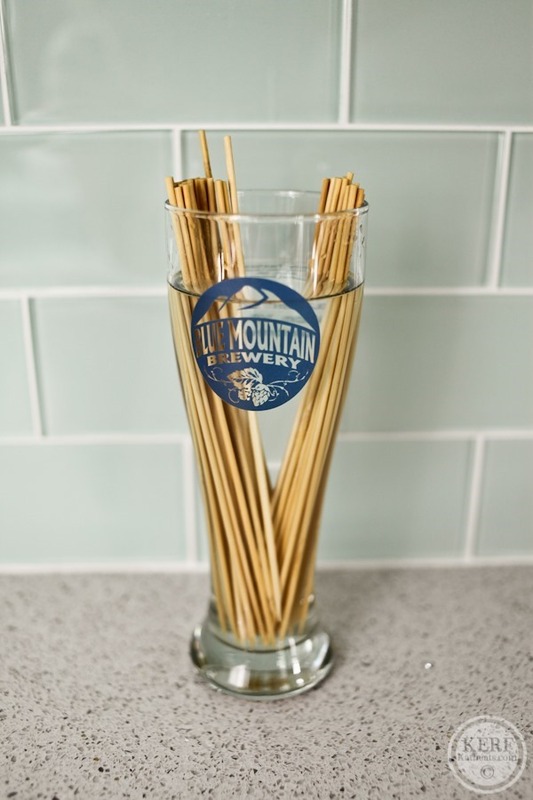 Soak skewers for a few minutes to prevent burning (if using wooden ones). Cut bell peppers into slices. 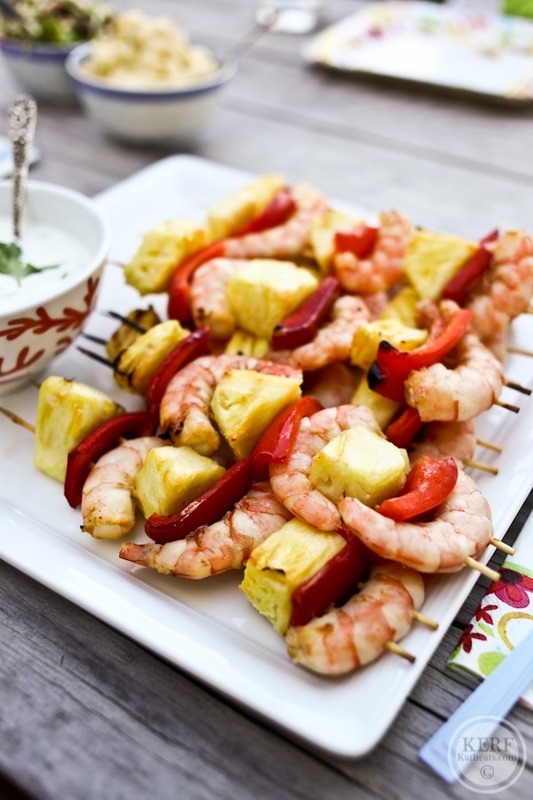 Assemble double skewers by putting two skewers through one shrimp and threading on pineapple and red pepper, alternating until you are all out of ingredients. Grill shrimp a few minutes per side - until opaque. Time will depend on how hot your grill is, but you'll need less time than you think or your shrimp will get rubbery. Weber Grills partnered with The Shrimp Council and sent us the lovely charcoal grill for this post. And I have one for you too! In honor of one of the country’s most popular pastimes, Eat Shrimp and Weber Grills want you to make this the #SummerOfShrimp. To make 2014 the best summer yet, Eat Shrimp & Weber are giving one lucky reader a Weber One-Touch Silver 22.5” Charcoal Grill. Feeling fired up? Head over to the Eat Shrimp Facebook page for a chance to win more prizes! This post is sponsored by The Shrimp Council. Our grill was provided by Weber Grills. yum! the orange juice/soy sauce combo sounds like a great marinade. can’t wait to try this recipe! grilled shrimp is the best shrimp! Love making kebabs, so much easier to grill the shrimp on a stick! 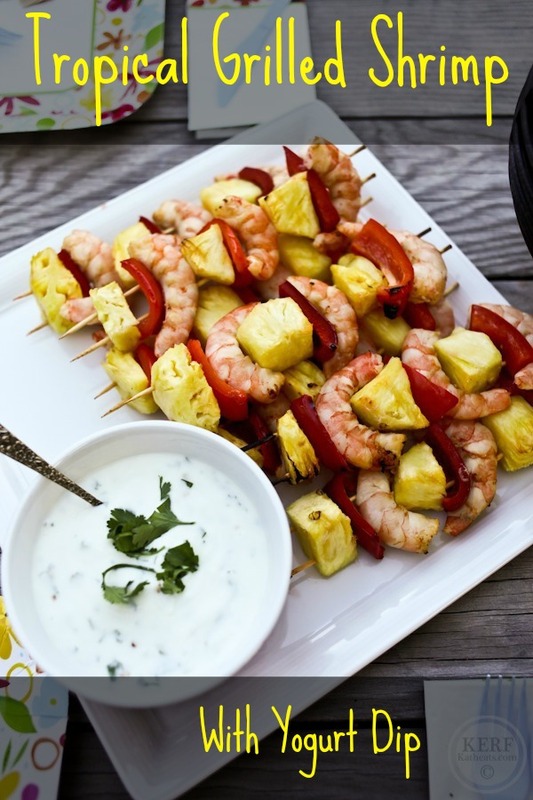 I love just a simple shrimp cocktail, but this recipe lots mighty delicious… I love grilled pineapple! Grilled shrimp and mango salad is a summer favorite! I think grilled pineapple would be amazing on a salad as well. What a coincidence; I just had grilled shrimp Saturday night! Similar marinade, except I used the juice of an orange, extra virgin olive oil, fresh garlic, and fresh ginger. So delicious! Love shrimp in the summer…especially since we live at the beach! Shrimp is delicious with a little cocktail sauce! Yum yum! 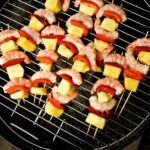 I’ve never tried shrimp on the grill before – but I bet it would give it a really awesome flavor! We only use our Weber to grill…it makes such a difference! Would love to wrap up a new one for Father’s Day! My favorite way to enjoy shrimp is in lowcountry boil! OH MY GOSH!!! That sounds soooooo good. Will definitely have to try this—soon!!! Thanks so much, and thanks for sharing the giveaway!!! Blessed be, hugs!!! Love this recipe and plan on giving it a go this weekend! Hard to beat shrimp and pineapple. Hope there was a freshly brewed beer to go with it! I absolutely love grilled shrimp kabobs and good ol’ shrimp cocktail! I’ve never had a grill, but would be so excited to have one for grilling in the summer. I like shrimp kebabs and have a recipe very similar to the one you used. I love pineapple but I’ve never tried it grilled. I can’t wait! I enjoy shrimp kabobs as well, but also regular old shrimp cocktail. I love grilled shrimp and veggies. 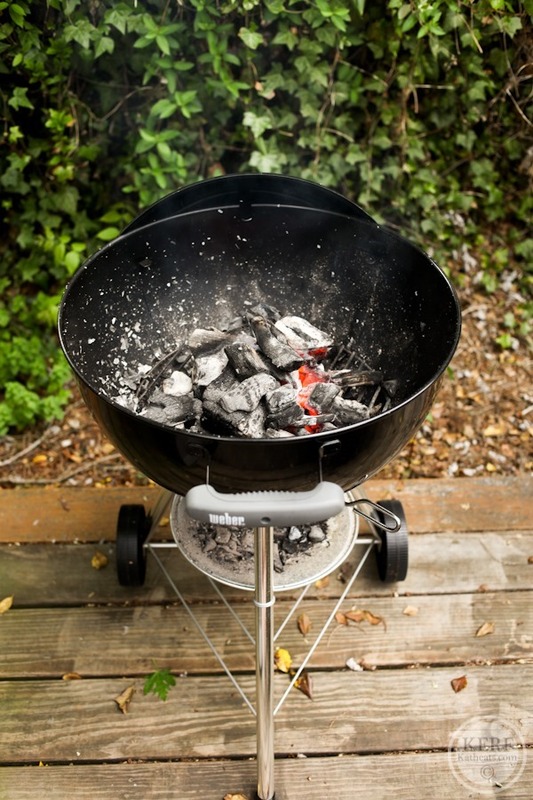 I LOVE charcoal grills…we just moved into a new house and have an old gas grill. this would be spectacular! Fresh caught peel n eat shrimp! Your recipe looks delicious! 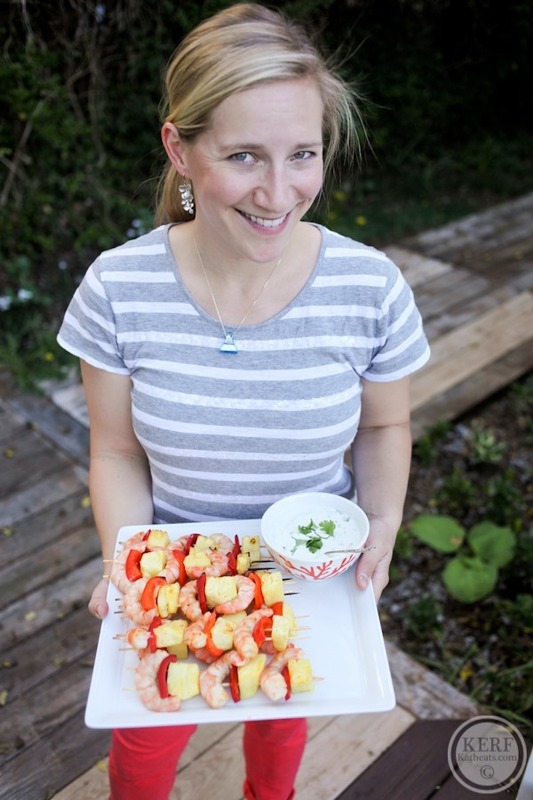 I love grilled shrimp with a simple citrus marinade in the summer time. The yogurt dip sounds yummy! Grilled shrimp on the barbecue is the best. I use a teriyaki marinade. Shrimp + grilled corn on the cob with a squeeze of lime is my dream! its more work up front because you have to get the charcoal going, but the smell is incredible! Yum! I’m a huge fan of anything BBQ. I’d say that enjoying shrimp with a little bit of mango/avocado/black bean salsa is my favorite summertime treat. Just seasoned with a little old bay is my fav! 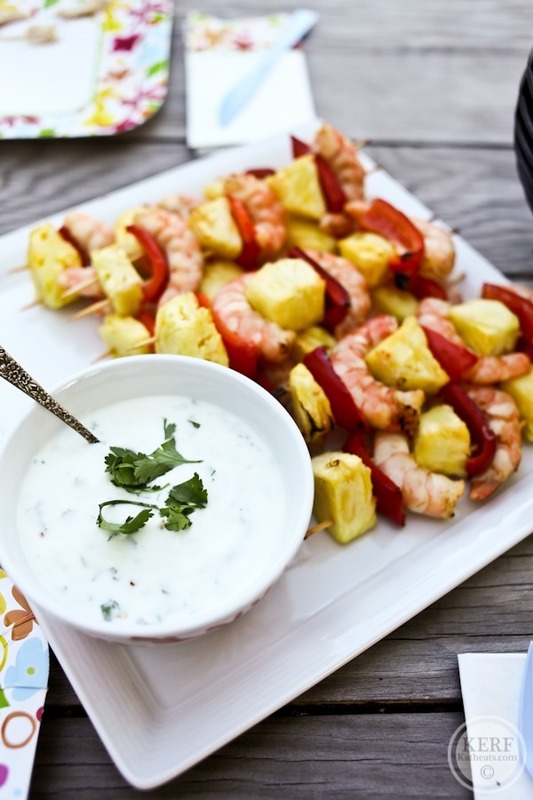 I love grilled shrimp – great pairing with pineapple and peppers…am definitely trying the yogurt dip. In the summer (or really any time of year! ), I love eating steamed shrimp with lots of old bay & onions, alongside steamed crabs is even better!! Looks delicious! Love how easy shrimp on the bbq is! I love coconut shrimp!!! Thanks for the chance to win! Stir fry, or steamed with Old Bay seasoning is my favorite. Any way! Shrimp = YUM! Great timing! I am moving to a new place with a deck soon and am need of a grill! Those look amazing! This makes me wish we weren’t in a tiny condo right now. We have to share a grill with the condo association 🙁 I miss grilling out. I love shrimp. I will have to give this a try. My husband is a HUGE charcoal Grill fan too. Love Weber grills. Used to sell them when I worked at Pleasants Hardware! Any way at all, really! But I love it grilled with some sort of citrus flavor the most! Love shrimp!! and a Charcoal grill would be an awesome way to get some cooking this summer. 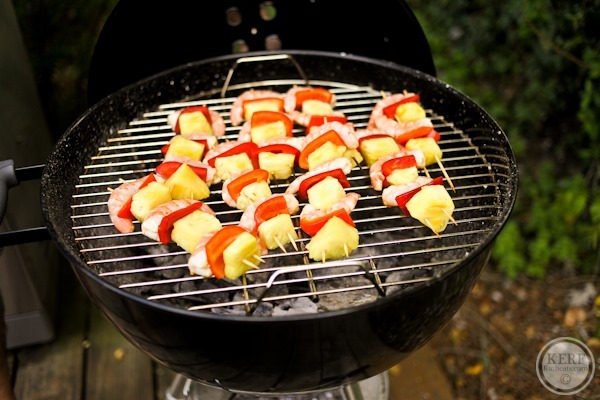 Grilled pineapple is one of the best things about summer! I mean sure, you could make it any time of the year, but it’s just so much better now! I put a half pound of shrimp in a foil packet with butter, garlic, herbs, and citrus (parsley and lemon or cilantro and lime are both delicious!). Quick and easy! 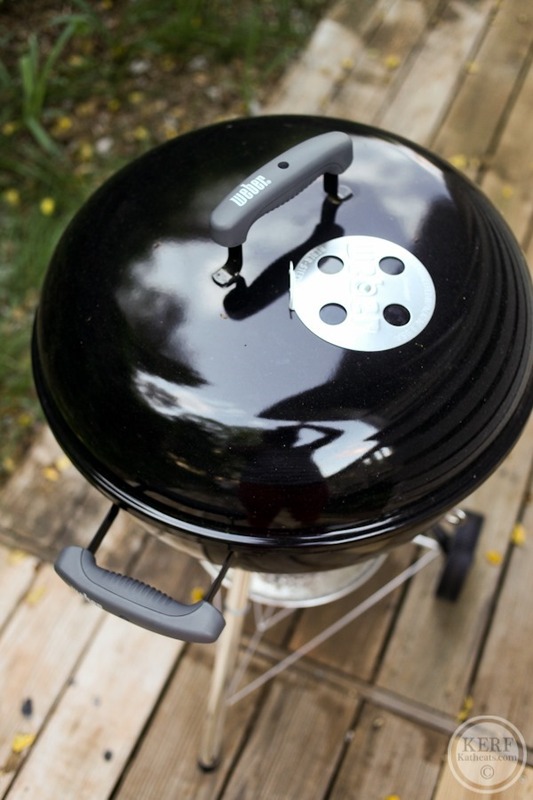 The grill would be a great Father’s Day present! I happen to have leftover shrimp cocktail over a salad today for lunch! but i LOVE grilled shrimp too! Living in New England seafood is abundant! Shrimp is my top choice for grilling! I love grilled shrimp or shrimp stir fry! shrimp and orzo salad with feta-it’s my husband’s favorite thing that I make and soo easy! I love my in-laws grilled shrimp; brushed with olive oil, butter, pinch of seat salt, and LOADS of crushed garlic! I love grilled pineapple! So yum! Love cold shrimp on a warm summer day! Shrimp on the grill is definitely my favorite way. Thanks for the recipe! The shrimp look fantastic! I like shrimp either grilled or boiled and sprinkled with old bay! We are about to move into a new house with a big backyard and a charcoal grill would be wonderful!! Boiled and chilled with Old Bay. I love marinated shrimp grilled on top of cold salads! Or mixed with couscous or quinoa & veggies. I love grilled shrimp in a garlic-lime marinade! shrimp in rice noodles with a splash of lime and fish sauce is divine. also, this is off topic, but those red pants look awesome!! Where did you find them? They are the perfect color. That color really highlights your blond locks and lovely skin ! Shrimp fajitas and old bay “you-peel” shrimp are definitely summertime favorites. Grilled pineapple is now on my official summer bucket list. Yum! Grilled Shrimp in a pasta dish is fantastic! I adore grilled shrimp! That marinade sounds so simple and delicious! 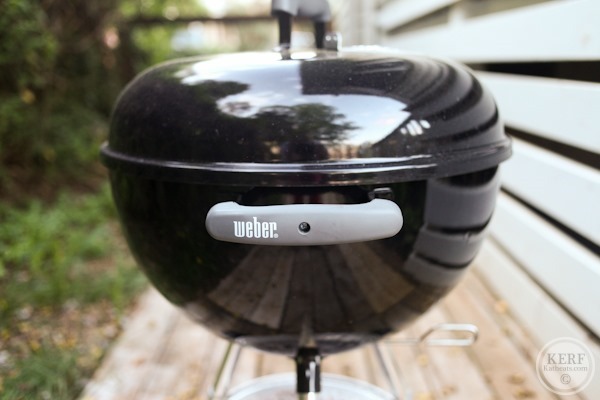 I’ve been wanting to get a Weber charcoal grill – so much more flavor than gas! Grilled shrimp is excellent to make shrimp cocktail with vs the usual cold shrimp. yum! definitely trying this summer, thanks! Shrimp cocktail with white horseradish cocktail sauce. That grill will make perfect grilled corn on the cob too !! I am putting this on our dinner menu this week!! I love grilled shrimp in a salad! 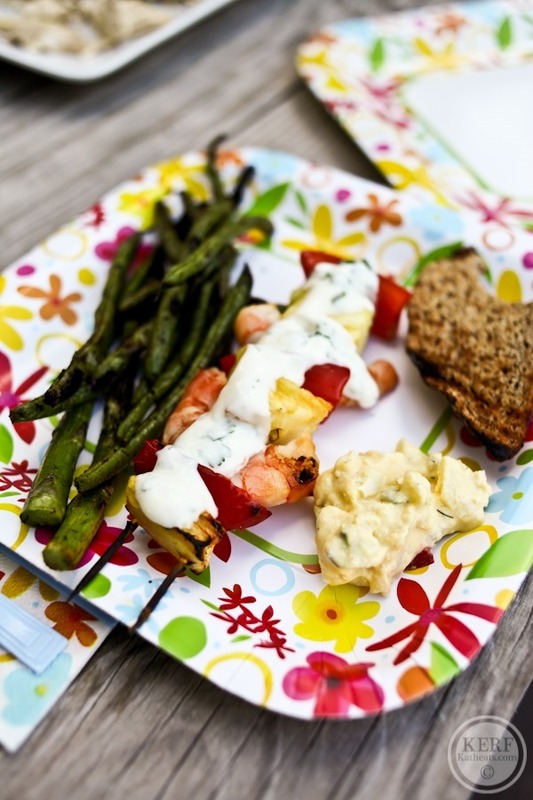 I’ve made a similar shrimp kabob before….so yummy! Shrimp ceviche or cold peel and eat shrimp! 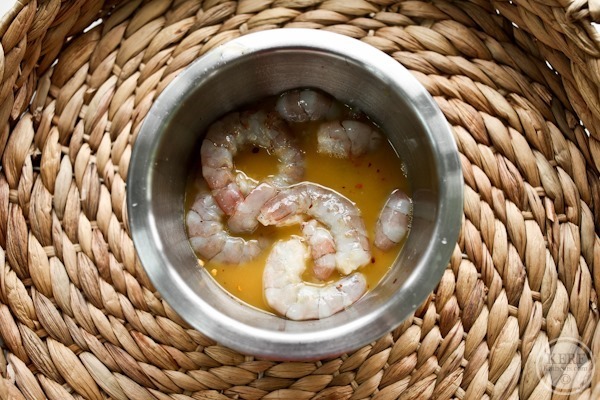 Still love a good ol’ scampi! I’m not a huge fan of shrimp, but this looks pretty darn good! One way I love shrimp is with Swiss chard (or other delicious green), onions, garlic, olive oil, parm cheese and pasta. Love a cold summer pasta salad! On a farm fresh salad! Love shrimp and the marinade sounds so yummy!! We love a shrimp boil!!! I haven’t had shrimp in years, but grilled is always a winner! Nothin’ beats shrimp on the grill. I like mine with just salt and pepper but I really should try other flavors. Grilled shrimp on top of salad! Man would we love a charcoal grill! We make a simple linguine dish with peso, pine nuts, goat cheese, and shrimp and it’s divine! I like my grilled shrimp on the barbie just like this with some grilled peppers and onions on the side and yummy strawberry salad! We are in the market for a Weber for our new townhome! The dipping sauce sounds amazing and unique. I like all of those items grilled too! I left a comment on Instagram that people took as mean. I just think you look so retro and fun and if you haven’t seen or heard about Portable Kitchen grills I thought you should check them out. I love your blog and have followed it for years. I never leave comments and so I am sure sorry if it was taken in a bad way. I haven’t seen those before but I’ll check them out. Yum!!! I’ll have to try this soon. My mouth is watering! These sound delicious, can’t wait to make them! Love them on the grill! Love shrimp on the grill! I am not a huge shrimp lover, but I have been trying it different ways lately because my fiancé really wants me to like it!!! This recipe may just seal the deal!!! I like breaded shrimp w/ cocktail sauce. Shrimp in all forms works for me (bbq shrimp, shrimp coctail, shrimp sashimi, it’s all good!)!!! My favorite way to enjoy shrimp is to grill them or make ceviche with them! Yum!! Yum! The shrimp and pineapple combo sounds amazing! Re-creating a healthy version of Bonefish Grill’s Bang Bang shrimp – soo goood. Love shrimp in pasta! Would love a weber too!! I love shrimp grilled or a low country boil!! On the grill and then tossed with asparagus, penne, tomatoes and pesto! Yum! Shrimp, angel hair pasta, roasted cherry tomatoes, and roasted garlic! I’ll take shrimp & grits anytime during the summer! I’m a vegetarian so no shrimp for me but I love kabobs! Grilled with lemon and garlic! Grilled pineapple is soooo good. My parents only use weber. My dad is a little obsessed even. Grilled or steamed with old bay! Food on a stick—->summer food 🙂 great recipe. Healthy and simple. I would love a grill for my first summer in my first home! 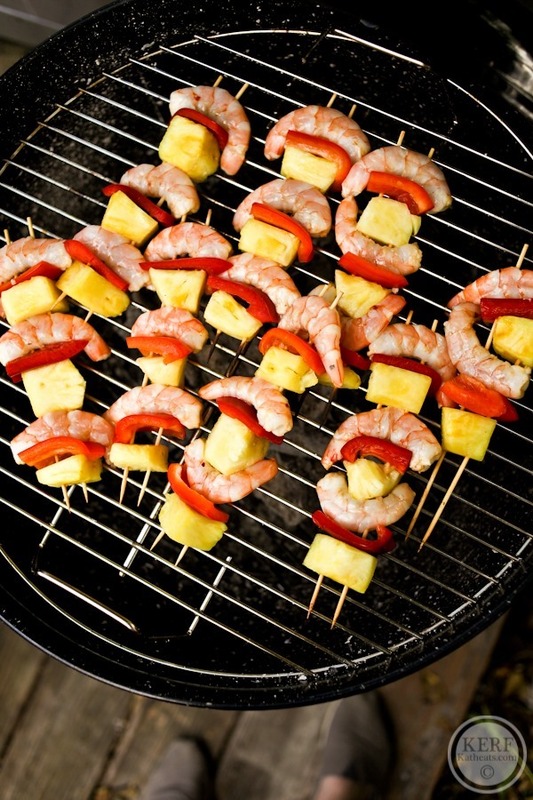 I adore grilled shrimp and pineapple! Yummy. My boyfriend and I will have to do some kabobs this summer mmmm. Shrimp cocktail or ceviche are my favorites! I love spicy chipotle grilled shrimp! Mmmm! I love making fresh spring rolls with rice wrappers, vermicelli noodles, shrimp halves, and shredded vegetables. And peanut red curry dipping sauce! What a great idea! I have the weber ( one different, with a container below), and we adore it. We are argentinians who love red meat bbq, but I am sure i can convice my husband to put shrimp for a change!! I love shrimp any and all ways, but char-grilled over a fresh salad is unbeatable in the summer! I just had a roommate move in so this grill would be perfect! grilled with olive oil and garlic! I love shrimp!! favorite way to cook is marinated in low fat Italian dressing and grilled!! yummo!! I want to try grilled bang bang shrimp! I love ice cold steamed shrimp with a good spicy cocktail sauce. So good! I’ve never had grilled shrimp and now I’m gonna have to try it. Thanks! I love shrimp!! Such a healthy BBQ choice. I’m not a big fan of shrimp, but when I do eat it, it’s usually grilled! I grill shrimp to have on Cesar salad and cold shrimp cocktail. Grilled with garlic and butter…yum!! Grilled shrimp with garlic butter! I love shrimp and orzo pasta with feta cheese and kalamata olives. My favorite way to eat shrimp is in ceviche — yum! I LOVE grilled shrimp with grilled pineapple and rice! The yogurt sauce is such a great idea! I love grilled shrimp on top of a greek salad or as part of a fresh stir-fry! Grilled shimp with lime juice and cumin! Sounds like a great recipe. Thanks for the chance to win a nice BBQ, which would be a wonderful way to begin the summer and eating outside! Thanks for the chance to win. Been a blog fan of yours for a long time. Kabobs are my favorite way to enjoy/grill most things in the summer. I love marinating meats/seafood and vegetables to grill. My favorite way to enjoy shrimp in the summer is BBQ! Definitely grilled — and tossed in a pasta salad! This looks delicious! Definitely grilled is my favorite way to enjoy shrimp. I love grilled shrimp over fresh salad in the summertime! grilled shrimp is one of my favorite foods in the summer. either plain or over a salad. I actually used to work at Weber in customer service during my college years. Fantastic company and people. I’m love grilled shrimp with honey/dijon sauce over charcoal. So amazing! Great recipe – and you can do so many variations with it – thanks for posting!